Ice Age Squirrel faith. I want that. Scrat faith. Parents with children of a certain age, and a bunch of my friends who love animated movies get this one. My Gayle was telling me a story this morning about hearing God laughing (yes, it is one of the many things my Gayle and I talk about all the time)…and while her frustration was real, God granted me sufficient discernment to see past frustration straight through to the blessing. All of a sudden I remembered the Ice Age Squirrel (Scrat)…. pressing on towards the mark. I want Ice Age Squirrel Faith. Scrat constantly hunts for his acorn either to bury it or eat it, but fate always gets in the way. He invariably ends up in humorous or painful situations: being struck by lightning, pursued by avalanches, and repeatedly knocked unconscious while fighting for his acorn. Yet he never gives up. 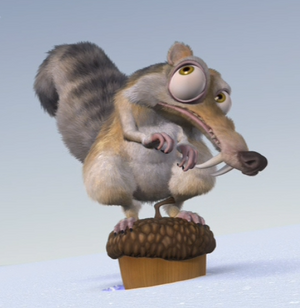 Scrat generally loses, except when he defeats a school of piranhas and successfully battles Sid for his acorn. Scrat is supposedly the only character to survive the ice age, as at the end of the first movie he was frozen in ice. He thaws out 20,000 years later on a tropical beach, where he causes an eruption. Scrat battles predators, natural disasters, all manner of calamity, every rotten thing you can imagine in pursuit of his acorn. He generally loses, but HE NEVER GIVES UP. Scrat is a lesson is pressing on towards the mark. I want that. I want Ice Age Squirrel Faith. As he who runs a race never takes up short of the end, but is still making forwards as fast as he can, so those who have heaven in their eye must still be pressing forward to it in holy desires and hopes, and constant endeavours and preparations. It's not that we shouldn't give up but that we cannot. We must press forward. WE MUST NEVER GIVE UP. There is a point at which each of us decides what we will and will never do. It might come over time, or for some, only takes a moment. Part of me wonders what the originators of Scrat had in mind to convey when they created and animated that little squirrel. Another part of me does not care. I see Your hand in the message, Father, and I smile and am encouraged as I get it. We may end up in piteous, humorous, or loathsome circumstances, but we are committed and never alone. Lord, as only You could receive this plea from me, give me Scrat faith. Give me the tenacity to see only You as the prize for which I must press toward the mark, NEVER GIVING UP. Knowing You're there, I can manage my fear and live through my failures, learning and leaning as I go. You've never given up on me…I'm never giving up. I bet I can make it to 100…. HAPPY 2nd BIRTHDAY, BLOG BABY!